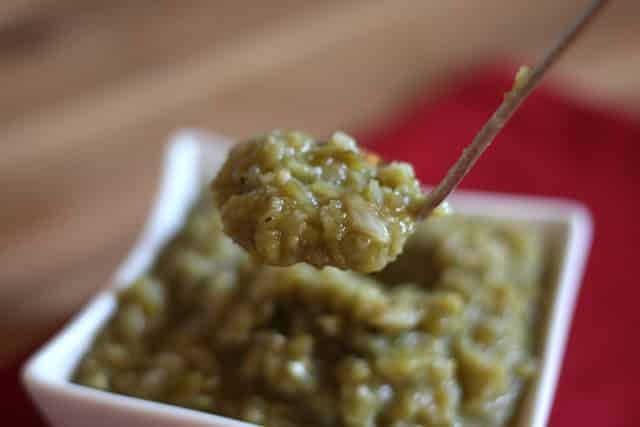 Green Chile Sauce is a staple ingredient in many homes in New Mexico. 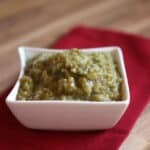 At it’s most basic, it’s simply pureed green chiles that are added to any number of dishes. However, with just a little extra effort, the green chile flavor is made even better with a handful of spices and a little bit of time on the stove. I like to make large batches of this sauce and stash it in the freezer for anytime we’re craving Mexican food. The question “Red or Green?” is heard frequently in NM restaurants. Wikipedia even lists it as the State Question for NM. My choice is almost always green while my kids choose red or green depending on their mood. My husband’s favorite answer to “red or green?” is “Christmas,” a combination of both green and red chile sauces on the same plate. There is a world of difference between a homemade green chile sauce and a canned version. This green chile sauce is incredibly flavorful with as much heat as you desire; just purchase mild, medium or hot green chile. This sauce can be made thick enough to scoop or thin enough to pour. I made mine nice and thick so that I could freeze the extra and not take up more space than necessary in the freezer. I simply add water to thin the sauce slightly as I was pouring it into enchilada layers. The thicker sauce is delicious just the way it is, served on eggs for Huevos Rancheros or in a burrito or burrito bowl. If you know when you make it that you’ll want a smoother sauce, use a small food processor to quickly mince the onions and peppers. Just a few pulses and it will be done. If you prefer a chunkier sauce, you can chop by hand and make the pieces as small or large as you like. If you have access to it, Hatch Green Chile is the most flavorful of any green chile pepper I have ever tasted. If you don’t live in NM or have access to Hatch chiles, Anaheim chile peppers are direct descendants of NM chile peppers. Anaheim peppers are grown and harvested year-round in Anaheim, CA and they are available across the country throughout the year. NM grown Hatch green chiles are only harvested once a year. 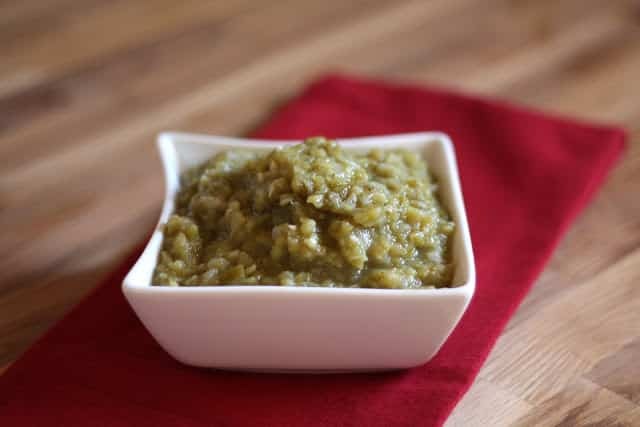 The limited availability of Hatch chile explains why many of my NM friends (and myself included) dedicate full shelves of their freezer for storing the roasted green chile throughout the year. In a large saucepan, warm the oil over medium heat. Add the onions and the garlic and cook, stirring frequently, until the onions are soft. Stir together the flour and the spices. Sprinkle this mixture over the onions and stir to coat. Add 1 cup of water to the mixture in the pan and stir to dissolve the flour. Add green chile and the rest of the water. Bring to a boil and then reduce to a low simmer for 15 minutes. Use within 3-4 days or freeze until needed. In a large saucepan, warm the oil over medium heat. Add the onions and the garlic and cook, stirring frequently, until the onions are soft. While this is cooking, stir together the flour and the spices. Sprinkle this mixture over the onions and stir to coat. Add 1 cup of water to the mixture in the pan and stir to make sure the flour has dissolved. Add green chile and the rest of the water. Bring to a boil and then reduce to a low simmer for 15 minutes. Use within 3-4 days or freeze until needed. Enjoy! That sounds about right. It should be a chile powder. 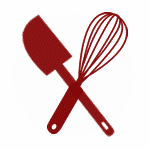 Would masa flour work in pace of the all-purpose flour . . . to add another layer of flavor? Or would the masa flour overpower the delicate flavor of the hatch chilis? Thank you for such a fantastic recipe. I added some freshly cracked pepper and a slurp of white vinegar at the end, just to replicate a sauce I enjoyed at a restaurant a few years ago that has now closed down. Thanks again fir sharing this recipe. I'm thrilled that you enjoyed the recipe, Heather. We love Hatch green chile. I hope you do too!